The 2019 NFL Regional Combine Invitational was rich with talented defensive players who were under the radar, and some of those unknown gems made the trip for NFL scouts worthwhile – as usual. The annual platform was designed to be a host for small institutions and other overlooked talent to gather before NFL scouts, who would not think twice to visit non-traditional NFL-ready programs to build depth for their respective clubs. Through the RC platform, 82 players made the NFL last season. And 35 of those players played on the defensive side of the ball. Each year, there are many players who either experience some notoriety or none at all. Fortunately, the 2019 NFL Regional Combine Invitational helped spotlight some unknowns who most likely would expect a call after the NFL Draft or nothing at all. Through the RCI last year, 10 defensive players signed to clubs, while six standouts in defensive linemen Justin Lawler (Los Angeles Rams), Mike Love (Buffalo Bills), Patrick Afriyie (Los Angeles Chargers), Joe Ostman (Philadelphia Eagles) and Abdullah Anderson (Chicago Bears) and defensive back Deatrick Nichols (Arizona Cardinals) completed the season from beginning to end. Lawler was selected in the seventh round (244th-overall) by the Rams and had a solid rookie campaign as a special teams ace. He finished with six tackles, and a trip to Super Bowl LIII. Love was promoted to the Bills’ active roster in Week 14 and went crazy for five tackles. The talent pool was deeper for the 2019 session. Due to solid trials, backed up with outstanding Pro Days, more players should make the league and more should be drafted. This year, a couple of players have a legitimate shot in becoming the highest drafted player from the annual discovery stage, which was established in 2015. In the 2015 NFL Draft, history for the RC platform was made when defensive back Tray Walker from Texas Southern was selected in the fourth-round (136th-overall) by the Baltimore Ravens as he was the highest drafted talent from the NFL Regional Combine. Walker was a special player and Ravens head coach John Harbaugh was extremely fond of Walker. Unfortunately, due to a dirt bike accident, Walker tragically lost his life in his hometown of Liberty City, Florida. Walker was 23-years old. Clearly, NFL fans, organizations and scouts are captivated by the glamour and glitz of mock drafts and the talents from the NFL Scouting Combine. But championships are defined by hungry players with chips on their shoulders. The overlooked. The counted out. The true ballers who will prove their worth. So, let’s see where these unknowns will fit, to no longer be counted out, but be counted on. -LB Cole Holcomb (North Carolina): Projected Round(s) 4th to 7th Round – 6-1, 235-pounds. Fiery, emotional, strong, great instincts, leader, intense, discipline hitter, solid technique. At the RCI, Holcomb showed elite speed for his position and explosiveness. DE Kyle Phillips (Tennessee): Projected Round(s) 4th to 7th Round – 6-4, 263-pounds. Athletic, good instinct, hands and feet, great leverage, balance, good speed, finisher. At the RCI, Phillips showed great intensity, passion and aggression. DB Nikolas Needham (UTEP): Projected Round(s) 4th to 7th Round – 6-0, 190-pounds. Smart, great speed and hands, savvy, fundamentally sound. At the RCI, Needham demonstrated elite speed, great anticipation, good pad level and quickness. DE/LB Anree Saint-Amour (Georgia Tech): Projected Round(s) 5th to 7th Round – 6-3, 245-pounds. A weener, ridiculously athletic, explosive, reckless, strong, explodes on impact, fires off the snap. One step – gone. At the RCI, Saint-Armour demonstrated not the best hands, but instinctive and great lateral movement. Was not able to complete his Pro Day due to hamstring injury. DB Chris Johnson (North Alabama): Projected Round(s) 5th to 7th Round – 6-3, 200-pounds. Huge, solid instincts, plays the ball extremely well (in flight and on impact), playmaker, confident, excellent in zone defenses, great speed. At the RCI, Johnson was fluent, moved effortless and great hands. DB Jalin Burrell (New Mexico) – 6-0, 195-pounds. Strong, smart, fundamental sound, solid technique, good hands, explodes on impact, plays hard, physical. At the RCI, he showcased good speed and track the ball well. DB Marvin Tillman (Western Carolina) – 6-1, 195-pounds. Lengthy, has solid instinct, plays the field well, active towards the ball, physical, good anticipation, decent hands, fiery. At the RCI, he ran hard, showed aggression and good hands. DB Tawain Gordon (Ohio Dominican) -6-1, 190-pounds. Physical, good in man-to-man, decent hands, read quarterback well, good closing speed. At the RCI, Gordon demonstrated great balance and control, intensity, solid pad level, good acceleration. DB Alexander Myres (Houston) – 5-11, 195-pounds. 5-11, 192-pounds. Aggressive, decent speed, good technique, solid special teamer. At the RCI, Myres showed his agility, has good balance and burst. DT Dare Odeyingbo (Vanderbilt) – 6-2, 282-pounds. Quick off the snap, aggressive, finisher, tough, smart, fill gaps, can take on double teams. At the RCI, Odeyingbo showed he has good technique and is light on his feet. Detailed some disruptive ability. DT Frederick Jones (Florida State) – 6-2, 304-pounds. Agile, good first step, solid pad level, physical, intense. At the RCI, Jones highlighted athleticism and agility. He explodes from his lower body, does not move tight and has quick hands. 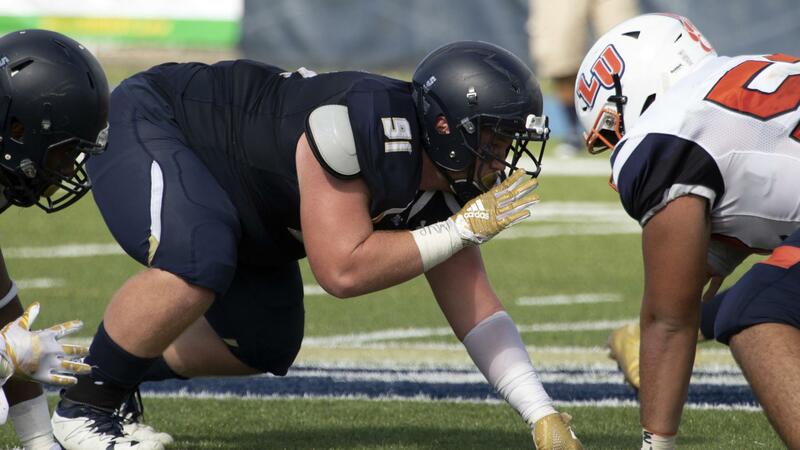 DE Tim Ward (Old Dominion) – 6-5, 255-pounds. At the RCI, Ward showed he is fluent and was in complete attack mode. He is agile with tremendous power, has a high motor and never quits. At the RCI, Vocco showed he has a high motor, solid lateral movement and light on his feet. He has good hand usage, balance and control. -RODERICK CHAPMAN (MISSOURI S&T) – 5-9, 175-pounds. Pretty much a complete athlete with speed, good instincts and playmaking abilities. -ANTONIO DAWKINS (BLUEFIELD COLLEGE) – 5-10, 190-pounds. Gritty, fast and versatile. -DARIUS WILLIAMS (CSU-PUEBLO) – 6-0, 200-pounds – NFL body, quick feet, good hands, explosive, physical. -ALDEN MCCLELLON (WEST FLORIDA) – 5-11, 195-pounds. Physical, love to blitz, solid hitter, aggressive, good speed and hands, fiery, good fundamentals and technique. -CUA’ ROSE (ARKANSAS TECH) – 5-10, 185-pounds – Ball hawking playmaker, decent hands, track the ball well. -ZURIL HENDRICK (EDINBORO) – 5-11, 190-pounds – Great hands, instinctive, polished. -KURRON RAMSEY (ALABAMA STATE) – 6-3, 200-pounds – Big, decent speed, discipline defender. -JUSTIN WYATT (LIMESTONE COLLEGE) – 6-2, 208-pounds. – A ‘weener’ from linebacker to safety, athletic, great hands, closing speed and anticipation, good feet, balance, instinctive, fundamental sound, quick burst. -K.J. REID (ARKANSAS TECH) – 6-1, 219-pounds. – Aggressive, solid technique, strong, fast, athletic, instinctive. -CODY LEONARD (QUINCY) – 6-1, 225-pounds. – Smart, fundamentally sound, strong hands, good speed, solid at point of contact. -ZACH MALONE (CONCORD) – 6-1, 215-pounds. – Compact, strong, smart, agile, instinctive. -J.T. HASSELL (FLORIDA TECH) – 6-0, 200-pounds. – Explosive, quick, good hands and feet, athletic, savvy, leader. -TERRY SAMUEL (WEST ALABAMA) – 6-2, 193-pounds. – Light on feet, good hands and pad level, quick, lateral movement. -DE MARKUS JONES (ANGELO STATE) – 6-3, 255-pounds. – Filthy, energetic, agile, intense, explosive, strong, savvy. -DE CARDELL RAWLINGS (WINGATE) – 6-1, 240-pounds – Solid, quick first step, patience, discipline, good hands. -JUSTICE BISHOP (UNION COLLEGE) – 6-2, 230-pounds. High motor, great hands, leverage, good technique. -ADONIS DAVIS (FLORIDA TECH) – 6-3, 255-pounds. Extremely athletic, quick, fires off the snap, solid instincts, crafty, smart, versatile. -DE JAMES PRATER JR. (ASHLAND) – 6-0, 244-pounds. Elusive, quick, strong hands, has good leverage, intense, finisher. -DE JAMARCUS HENDERSON (NEWBERRY) – 6-0, 230-pounds. – Classic bull rusher, explosive off the edge, solid closing speed, powerful, quick, shifty, athletic. -JOE BLUE (NEWBERRY) – 5-10, 225-pounds. – Extremely athletic, strong, high motor, relentless, good feet, agile, great pad level, finisher.